Recent innovations in coating technologies have dramatically improved the analytical sensitivity and test precision of process sample transfer and analytical systems. Poor surface inertness can result in performance issues ranging from poor sensitivity and resolution, to adsorption/desorption and catalytic effects. The overall impact to the customer includes regulatory compliance issues, lost product, poor process yields, and ultimately lost customers. This study compares the surface inertness of 2 coatings on the inner walls of 1/8” stainless steel tubing: SilcoNert®2000 (SilcoTek® Corporation) and Silonite™ (Entech Instruments Inc.). The data show significant differences in surface inertness of the two coatings. SilcoNert® 2000 and Silonite coated tubing sections (1.0m long x 1/8” OD x 0.85” ID) were tested for various active compounds (see appendix A for test compounds and test results). 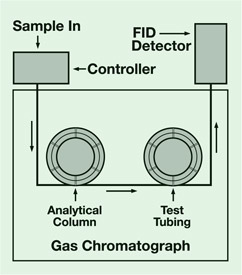 The test tubing was connected to the end of an MXT-5 analytical column (Restek Corp.), and tested on an Agilent gas chromatograph model 6890 (Figure 1) See appendix B for test conditions. Figure 1 - Experimental setup comparing the inertness of SilcoTekTM2000 and Silonite tubing. A test mix containing active and non-active compounds was first injected into a control analytical column without any connected 1/8” tubing. Test results show superior results with all compounds resolved (Figure 2). 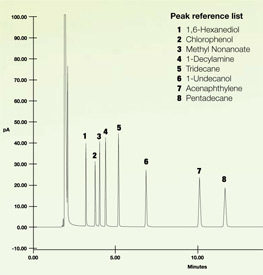 Figure 2 - Control analytical column shows superior results, with all compounds resolved. A SilcoNert®2000 coated tube was then installed in series after the analytical column. The test compounds were then injected into the column combination under similar conditions as the control run. 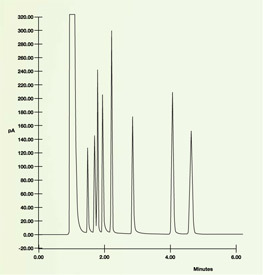 Results show nearly identical peak resolution and response with the SilcoNert 2000 tubing with little to no loss of active compounds (Figure 3). Figure 3 - SilcoNert 2000 coated tubing provides exceptional inertness with nearly exceptional transfer of compounds. The SilcoNert 2000 tubing was then removed and replaced with the Silonite tubing. Test compounds were then injected into the column combination under similar conditions as the previous run. 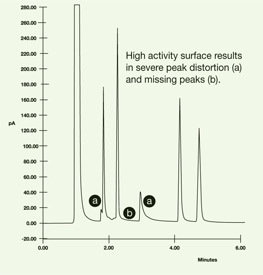 Results show significant loss of active compounds with a high distortion of signal (peak tailing and broadening) and loss of peak area (Figure 4). Figure 4 - Silonite coated tube shows significant loss of compounds with high peak tailing. Tests show the SilcoNert 2000 treated tube is the least active surface for analytical and process sampling. The Silonite surface is drastically more active. Exhibiting significant surface activity with very poor resolution of active compounds. Figure 5 shows the relative activity of each coating based on test results of the 8 active compounds. For a mildly active compound such as 4-chlorophenol, the SilcoNert 2000 surface showed nearly 6.7 times better response than the Silonite surface. For a more active compound such as 1,6-hexanediol, the SilcoNert 2000 column surface showed a response nearly equal to the response seen on the analytical column alone. With high activity compounds the Silonite column system showed total adsorption of 1,6-hexanediol. See Appendix A for comparative analytical data. SilcoNert 2000 surface is demonstratively the most inert surface for sampling, transporting, or analyzing active compounds containing active functional groups such as diols, nitrophenols, sulfurs, and mercury compounds.